Black Mountain Fire Lookout (elev. 7,772 ft.) is located in the San Jacinto Mountains. 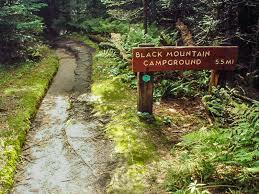 Access is via either a 1-mile round-trip hike on a dirt road from Boulder Basin Campground, or the longer Black Mountain Trail. The tower is staffed by volunteers and is usually open between 9:00 am and 5:00 pm during fire season. Visitors are welcome to come up to the top and view the mountains, learn about the National Forest, use the Fire Finder and learn about fire prevention. The tower season is generally from Memorial Day to November. 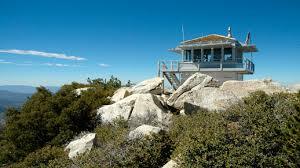 Built in 1926, Black Mountain was the third lookout built on the San Bernardino National Forest. In 1935 the original lookout was disassembled and rebuilt on Barton Peak. The lookout that sits on Black Mountain today was completely in 1962. Black Mountain has spectacular views of the Santa Rosa Mountains, Mt. Palomar Observatory to the south, San Gorgonio Pass to the north, and on a clear day you can see as far as the ocean to west. Occasionally, hosts and guests are greeted by glider planes that come over San Jacinto Peak, riding the desert and mountain wind currents, wisping by silently.